Brains!!!! 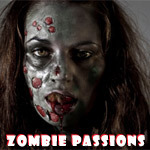 The only thing in short demand at Zombie Passions is brains! You will find plenty of zombie hunters, zombie lovers, and yes, even an occasional zombie. Zoosk is one of the larger online dating sites, even though it is much newer than some of the older players in the market. It has fun look and feel, and is worth checking out.